PVD is the abbreviation of Physical Vapor Deposition. It is a process carried out in high vacuum at temperatures between 150 and 500 °C. The high-purity, solid coating material (metals such as titanium, chromium and aluminium) is either evaporated by heat or by bombardment with ions (sputtering). At the same time, a reactive gas (e.g. nitrogen or a gas containing carbon) is introduced; it forms a compound with the metal vapour and is deposited on the tools or components as a thin, highly adherent coating. In order to obtain a uniform coating thickness, the parts are rotated at uniform speed about several axes. THIS PAGE IS still UNDER CONSTRUCTION... We'll be adding and editing this to make it more clear. Check back soon! A very important process that allows the carbide end mill to resist wear is the coating. Coatings enable the cutting tool to evacuate chips from the flutes faster thereby getting the HOT chips off of the end mill's ground surface. Heat is not carbide's friend. In the last decade, the technology to provide more heat- and wear-resistant coatings has promoted longer tool life and increased productivity. The integration of hard coatings in cutting tools has reached a mature stage after more than three decades of proven performance and productivity benefits in industrial metal cutting. Chemical vapor deposition (CVD) was the first technology used, which advanced from single layer to current multilayer types combining TiC, TiN, TiCN and Al2O3. almost 35 years later it is evident that novel physical vapor deposition (PVD) compositions have surpassed the limited set of available CVD coatings. The relative economics are debatable but it is accepted that total life cycle consideration and environmental friendliness favor PVD technology. Succeeding generations of PVD hard coatings have become commercially available, notably TiCN, TiAlN and AlCrN, with demonstrated success in expanding areas of application. The more common coatings on the market today include TiN (titanium nitride), TiCN (titanium carbon nitride) and TiAIN (titanium aluminum nitride) or AlTiN (aluminum titanium nitride) - the latter having more aluminum content. The coatings that have become the most popular are the TiAIN- or AlTiN-coated end mills. They are much more effective effective at dissipating heat than the TiN coatings from 20 years ago. The heat is dissipated so well into the chips with the AlTiN coating that dry machining is mostly recommended, except when slotting where the chips need to be expelled out of the channel. The aluminum in the coating helps form a gaseous aluminum oxide layer at the cutting edge where temperatures can reach more than 1800°F. This helps protect the carbide substrate from the damaging effects of heat. That's what makes this coating ideal for high-speed and hard milling, especially in dry cutting. For machining aluminum, brass, plastics and other nonferrous materials it is best to use our Stealth coated end mill with polished flutes to prevent edge buildup. Aluminum Titanium Nitride (AlTiN) and Titanium Aluminum Nitride (TiAlN) is a thin film coating that was developed from Titanium Nitride. AlTiN offers higher temperature resistance than TiN, as well as slightly higher hardness and especially higher hot hardness (i.e. the hardness at high temperatures). Molybdenum Disulfide Coatings (MoS2 coatings) , also known as Moly Coatings are commonly used in applications where operating temperature and coefficient of friction are primary concerns. This coating provides effective lubrication in a wide range of loads, in many cases exceeding 250,000 psi. Moly coatings lubricate sacrificially by transferring lubricant between the two mating surfaces, which helps to reduce wear and coefficient of friction. 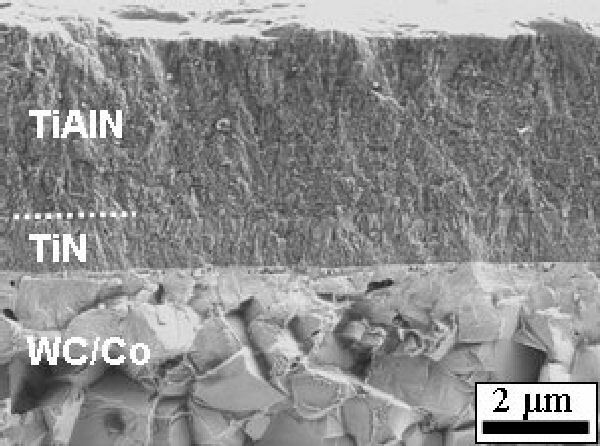 Molybdenum Disulfide (MoS2) coatings are a dry film lubricant. Initially developed for dry machining applications, MoS2 is used in applications where increased lubricity or a very low coefficient of friction will be beneficial. MoS2 based coating is applied in a PVD process. This unique coating is sometimes referred to as Teflon®-like in that nothing sticks to the coating. MoS2 can acts as a barrier to material galling. Dry machining applications are a natural fit for MoS2 coating, especially when machining aluminum or other “gummy” materials.